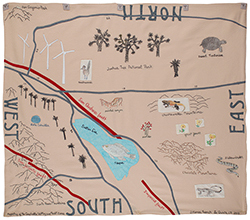 Living upon a web of fault lines, as all Californians do, Jessie Homer French decided to make “safe art for above one’s bed in case of temblors.” Her “mapestries” are hand-embroidered maps made of a variety of cloths and threads that resemble the qualities of quilts. Most of the mapestries in this exhibition are based on the area she inhabits, the Coachella Valley, Joshua Tree and Salton Sea, while others focus on the LA Basin. The fault lines themselves are one inch wide strips of cloth that traverse through finely stitched palm trees, roadrunners, chuckwallas, ocotillos, and highways. 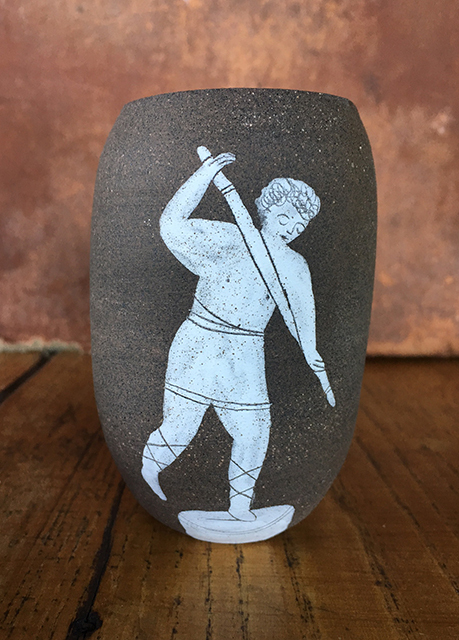 Her work combines elements of traditional gendered handicraft with a contemporary, environmental awareness and place-oriented sensibility. D.J. Hall also lives in the Coachella Valley, though part-time, and her iconic paintings of women in big sunglasses lounging poolside with drinks, cakes and magazines were the subject of a major retrospective at the Palm Springs Art Museum in 2008. 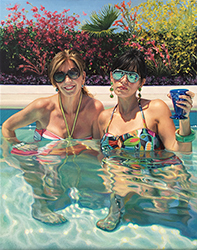 Hall partially attributes her interest in these subjects to a sometimes difficult childhood that found moments of happiness in her birthday parties in the backyard and the pool of her grandmother's home. Her glamorous women are able to function as personal "illusions of reality" as well as social commentary on our image-conscious culture. This exhibition includes paintings as well as a large tapestry, a selection of small plein-air landscape studies and a new series entitled, The Riff Project. Inspired by an arbitrary grouping of thumbnail images of her paintings on the computer, Hall created archival pigment prints of these images and arranged them in long horizontal grids and face-mounted them to plexiglass.